Are you a hospital administrator, department head, or otherwise involved in the purchasing of medical equipment? Would you like to get the most out of your used medical equipment purchases? “A Professional Guide to Purchasing Used Medical Equipment” is specifically geared at educating individuals responsible for purchasing used medical equipment with the elements that they need to be aware of, prior to making purchases. 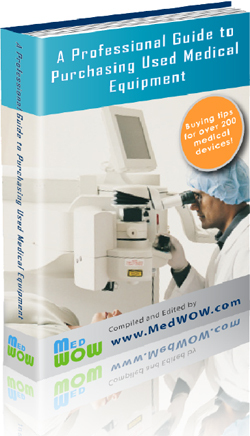 The guide is being distributed by MedWOW.com, a leading online marketplace for buying and selling used medical equipment. The site, which has received acclaim for its innovative tools aimed at facilitating the online trade of used medical equipment, developed this guide in response to the countless requests that they received from buyers seeking their professional buying assistance and advice. The guide is the result of extensive research and conclusions conducted by MedWOW.com and its affiliated team of medical equipment experts, doctors, technicians, and engineers from around the world. Written as a guideline, this book provides you with thousands of buying tips for over 200 of the most common medical devices used in clinics, hospitals, labs, rehabilitation centers and other medical facilities. Moreover, the tips include emphasis on the important features, specifications, and capabilities to consider for each medical device. Very few people understand how many medical machines are in use everyday. There are so many different types that they require specialized physicians who are trained to operate them. These individuals, known as radiologists, work closely with these machines for years in order to learn how to operate and interpret their data.